This is a bold move by Cisco (given it's commitment to SIP) to expand industry thinking around presence as well as expanding its thinking around real-time applications given the type of development capabilities made possible with XMPP. So suddenly, I see both Avaya and Cisco as the new thought-leaders when it comes to presence (especially in regards to "social presence"). Microsoft and IBM are locked into yesterday's view of presence and where it needs to go. Question: What will Avaya do since they OEM'd their XMPP capability based on Jabber's platform. The solution will show up first in the WebEx world (e.g., Media Tone Network, WebEx Connect) and then follow with an on-premise implementation. Federation will emerge as well between the cloud/SaaS world and on-premise implementations. Given XMPP's use within the government and financial sectors, this move will also help Cisco expand its customer relationships with those organizations. Involvement with the XMPP Standards Foundation will provide Cisco with opportunities to grow the community and partner ecosystem interested in XMPP from both an open source and open standards perspective. XMPP support will also help interoperability with Google as well as with other vendor's in the collaboration and social software space that leverage XMPP (i.e., Jive Software, Twitter). Overall, the move continues to help Cisco build-out a platform and ecosystem for both its UC and evolving collaboration/Web 2.0 efforts. SAN JOSE, CA -- 09/19/08 -- Cisco (NASDAQ: CSCO) today announced its intent to acquire privately held Jabber, Inc., a provider of presence and messaging software. Based in Denver, Jabber will work with Cisco to enhance the existing presence and messaging functions of Cisco's Collaboration portfolio. Cisco, the Cisco logo, Cisco Systems, Cisco WebEx and IOS are registered trademarks of Cisco Systems, Inc. in the U.S. and certain other countries. All other trademarks mentioned in this document are the property of their respective owners. The use of the word partner does not imply a partnership relationship between Cisco and any other company. This document is Cisco Public Information. There were two notable comments to my earlier post (and cross-post) on the concept of social presence and the role (or non-role) of UC vendors. Blair brings up a direct concern (security) and an indirect concern (surveillance). Both are credible issues. Any social presence platform would clearly need to include a policy management component that would integrate with security and identity management systems within an enterprise to support authentication, authorization and related demands (e.g. logging, audit, archival, and records management). An enterprise would require the capability to impose certain policies on a social presence platform to satisfy governance, risk, compliance or other demands. Additionally, any such system would have to have a permission model with access controls that enable people to manage their own “presence”. But I don’t see this as any more of a roadblock than what we expect from other tools – not just those related to UC but also those related to social software in general (e.g., e-mail, calendar, blog and wiki platforms). So while a valid comment, it applies equally to existing tools almost universally. In fact, I point out the need for such functionality in a recent most on microblogging within the enterprise. To be clear – yes – any social presence platform will need to be secure, integrate with existing infrastructure, and support some type of federation model for interoperability with the external world. The inferred point regarding surveillance is more interesting and properly points out the social dynamics involved as we share “lifestreams” of information about ourselves as we go about our activities. In a blog entry posted in April of this year (Participatory Surveillance: Co-mingling Intimacy & Exposure), there are pro and con arguments that are equally valid concerning how people interact in a mediated public space. Some people will feel very comfortable while others will become rather nervous as they are “followed” by people they may not know – even if they are other employees. Such a concern reinforces the need for controls that allow users to limit their visibility, to filter what they share or to even block someone from tracking them. But – other people and groups may find such capabilities quite valuable in terms of improving shared situational awareness and enabling people to self-synchronize with the conversations or activities of others. There’s no right or wrong – just the need for a social presence platform to include controls that each person can customize how much or how little they wish to expose. The last point regarding “business presence” vs. “social presence” I believe is more of a contrived debate. The term “social” is often inappropriately equated to “play” or to “waste of time”. Organizations will tell me “we’re pursuing corporate social networking” or “we prefer to user the term ‘professional networking’ rather than social networking”. I don’t mind if people want to label something differently but to a great extent “it is what it is – no matter what we call it”. What is “business presence”? Are we going to limit presence only to the meta-data status of someone (on the phone, in a meeting, etc)? Is business presence going to be limited to some set of formal states? What are "corporate/professional networks"? Relationships are hugely influenced by underlying social constructs. Our desire to understand the social aspects of how work gets done and how people leverage informal connections has been a long-sough goal of those involved in knowledge management, organizational development, learning and other initiatives related to community-building. I totally agree with you and I agree that social networking and UC and presence are all tied in together (I love your term social presence). I do have a concern about mixing social presence with business presence. Do I want my calendar information and status information available to someone who follows me because they want to hear what I have to say about UC, for example? And security can be an issue as well - people can know when I'm out of the country on a family vacation, meaning there's no one home guarding the house, except my cute little dog which they can see pictures of on my social networking sites. So I agree with the concept, but feel that it will require lots of rules, permissions, security settings, etc. that we have to think about. Dave felt that I was perhaps too hard on UC vendors. I disagree. Clearly federation is a challenge - especially intranet federation. And yes, we can move the food around on the plate and do a better job with the current presence model. But the bigger problem is "that vision thing". Once large vendors get to a point where they have a product in the market for some time (IBM), or are building a product that targets a given market that they have long sought to enter (Microsoft), there is reluctance to push the reset button and take a fresh approach if that approach impacts the existing product. UC-presence will continue down its current trajectory (remember, I'm not saying that UC-presence is not valuable - just that it is limited and can only be advanced so far). Other vendors (Cisco, Jabber) also seem entrenched in this narrow view of "presence". If a vendor wanted to disrupt the status-quo, I would imagine that delivering a social presence platform might be an interesting way to open up new dialogs with business and IT decision makers and get some media attention as well. It will be interesting to see if a project associated with SAP (called "ESME", which stands for "Enterprise Social Messaging Experiment") gains traction in this regard. What UC vendors should find the strength to admit (and Avaya is the first one to arrive at this point) is: (1) presence is much broader than how UC has defined it, (2) presence needs to be an independent capability with open interfaces to a variety of different applications, (3) SIMPLE has become an inappropriate standard for the next generation of presence, and (4) social networking trends are foreshadowing where presence needs to go. I expect IBM and Microsoft are going to protect their current investments, will try to position "rich presence" as defined within the UC world as actually being "social" and come up with tactical ways to bridge it to social networking trends. Right now, neither is offering a "vision" of presence beyond the products they wish to sell. I expect Microsoft to continue to limit integration and interoperability of its proprietary "rich presence" services with other vendors. IBM will play better with others - but it's still about Sametime and not a step towards social presence as I see it evolving. I would hope that UC vendors are getting ideas from folks like Attensa, NewsGator, RSSBus or Gnip; leveraging work being done at Project Rome or Apache Abdera - and learning how to exploit microformats as well. These are some of the core elements I feel are necessary to deliver a social presence platform that works with existing UC platforms but is not tied down by the presence baggage of those systems. Perhaps you were a tad too hard on UC vendors for doin' a what comes natural in using UC-centric presence models. Application-specific presence isn't the cardinal sin - lack of (presence and other) federation is the real problem. Presence information is valuable and adding custom presence states that are appropriate for specific applications can add great value to a solution. For example, for UC applications, it might be useful to have presence states that differentiate between speaking on the phone handset versus the speaker. This distinction is useful because more care must be taken speaking on a call that is being broadcast over a speaker. But if this custom presence state doesn't follow open standards and can't be published to other systems, its utility becomes vanishingly small. It is gauche to design closed-system communications offerings (and social networking services, collaboration applications, etc.) which can only work for people within the walled garden system. Once enough of the market understands how useful presence is, systems with non-standard, unfederated presence models will have to get with the program, or be left behind. Disclosure: I'm employed by Jabber, Inc., a company that has so much belief in the Power of Presence(R) that the phrase is our company tagline and a registered trademark. It was inevitable that Twitter-like services would emerge targeting a business audience. While the term “microblogging” is frequently used to describe these platforms, they could also be considered as a derivative of group chat and instant messaging platforms as well. Within the enterprise, it is highly probable that IT organizations will classify these tools as messaging platforms (I would BTW). As a messaging platform, these tools would have to support security, logging, audit and archival functions to satisfy regulatory, compliance and records management demands. These requirements might “ruin the party” about how people foresee microblogging taking off within the enterprise – but better to plan for such features now, and push vendors to deliver those functions, than ignore some basic blocking-and-tackling issues that inhibited rollout of enterprise instant messaging. In fact, the other debate that will go on internally within enterprise organizations will be the overlap between microblogging tools and instant messaging tools that support group chat. Will existing instant messaging vendors (i.e., IBM and Microsoft) support Twitter-like capabilities as an extension of their existing UC platforms – or – will there be a sustainable market opportunity for new entrants to deliver such messaging tools to an enterprise audience? Microsoft acquired Parlano some time ago which could be extended to be a “Twitter for the enterprise”. IBM’s Sametime already has large-scale broadcast and group chat capabilities as well. But, as my earlier post on social presence outlined – will UC vendors/product teams (who seem to have a narrow view of the world when it comes to social networking), expand their platforms (e.g., beyond SIP/SIMPLE) to support concepts related to social presence as well as concepts related to microblogging? Or will they continue to prioritize their own products as the be-all-end-all hub for these types of applications? The media event, which ended Wednesday night in San Francisco, has ironically been very high profile on Twitter, the platform famous for originating ‘ambient intimacy’, Other microblogging platforms with traction amongst users include Plurk, Pownce, indenti.ca and Jaiku, with more options popping up practically daily. ESME is interesting because it focuses on real world application of Twitter style functionality in the SAP ecosphere. From early feedback the Vegas SAP TEchEd crowd didn’t go wild over this innovative project unlike Yammer’s reception in San Francisco, the reality is most internal enterprise people don’t understand the utility of this type of communication yet. The bigger challenge – completely understood by early business Twitter adopters such as @zappos - is making a standardized micro blogging platform as intuitive to use as email or the telephone for business users. The title of this post might seem to be self-contradictory. After all, we associate presence as a foundational capability within unified communications. Indeed, several blog posts have recently highlighted the importance of presence as a core component of a UC platform while noting interoperability challenges across UC systems. Today, companies worry about different vendors' PBXs talking to phones and to each other, as well as to applications such as contact centers. But the major bone of contention going forward into UC is presence and the need to "federate" presence engines. I do believe this was conventional thinking for quite some time but this “old school” thinking needs to stop or UC will take years to reach its potential. Also, it’s just flat out wrong. Presence, not VoIP, should be thought of as the foundation for UC. On the nojitter site recently, a couple of my fellow analysts wrote some interesting pieces about the role of presence. I completely concur with their assessments that presence is the foundation of UC. In fact, I believe that presence is one of only three or four elements that are necessary for a UC solution. Many people consider presence to be a companion technology that goes along with instant messaging, telephony/VoIP, conferencing and mobile technologies. But if you are paying attention (and the posts above are well-worth reading), you can sense that people are beginning to believe that “presence” should be thought of as a topic in its own right – as a distinct and independent capability that augments other UC-related services rather than some type of sidekick that follows along. For those that have followed my research in the real-time collaboration field here at Burton Group and from my Meta Group days, you’re aware that I’ve talked about presence as an independent architectural domain within UC for some time (circa 2004 as I best recall). I’ve also posted previously on this blog about the changing nature of presence and the need to fundamentally reset our assumptions. While presence will remain a core element within platforms for unified communications, the social dynamics around presence require all of us to look beyond how presence is defined, packaged and delivered by UC vendors (e.g., Cisco, IBM, Microsoft). The benefits of “presence” span far beyond the boundaries of unified communications. In fact, presence is on its own convergence path with social networking trends. What I hope people tracking the UC space begin to recognize is that presence is more about enabling social context and social connectedness than it is about communicating awareness of a particular communicate state. Today, the UC concept of presence can be thought of as a type of network “state record” – the presence of an entity is made available to subscribers of that entity’s presence (e.g., displayed on a “buddy list” or within a presence-enabled application). The subscriber is often made aware that the entity is online and has some glimpse into their ability to communicate (e.g., “in a meeting”, “out to lunch”, “away from desk”). Modern systems typically include a richer amount of information including a profile of that entity. While this capability is incredibly powerful (leading people to talk about the benefits of presence-enabled applications and communication-enabled business processes), it is also inherently limited by its underlying assumption of “state” and dependency (for the majority of vendors) on SIP/SIMPLE for the underlying infrastructure. Rather than think it terms of a “state record” (or row) where we keep adding additional information fields for presence and profile data (columns in that row), we should be examining social networking trends and how other tools are attacking the presence problem (even though the term “presence'” is not often used). The term “lifestream” is often used to define this type of presence stream solution. Each entry (“row”) highlights an activity that someone has decided to share in a public or semi-public manner (e.g., a blog post, social bookmark entry, music rating, travel movement or status update). A presence stream reflecting activities of that person can be displayed in multiple contexts. The complete stream or fragments of the stream can show up on that person’s blog, or on the profile page of their social network site. Elements of their lifestream can be combined with entries from other people to form an aggregated stream of information that provides a more social view of the activities of people they are following. This new type of presence model creates a type of social context and sense of connectedness that is not easily replicated in the UC world. The result of this type of aggregation of activities enables a type of social awareness that builds on principles originally associated with the UC concept of “presence”. The intersection between social networks and unified communications will form the basis for a hybrid approach perhaps best described as “social presence”. Social presence provides a broader sense of awareness of a person’s interactions and activities by blending information from a variety of applications, productivity tools, social network sites and communication platforms into a chronological stream. The “over time” perspective one gains provides a richer sense of someone’s “presence” than the state-record snapshot we have today in UC platforms. 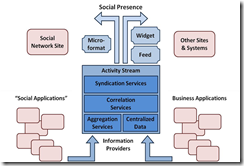 Applications publish information fragments aggregated by a social presence component that centralizes the data. Correlation services analyze the information and package entries into an presence stream which is shared with subscribers. Blended group streams based on a collection of people being followed should also be supported. Applications could also subscribe to a “social presence” stream and contextually display that information as needed. What goes into this presence stream would be very open (e.g., blog posts, bookmarks, status messages, calendar events) in a way that mimics consumer counterparts (e.g., FriendFeed, Twitter, etc). 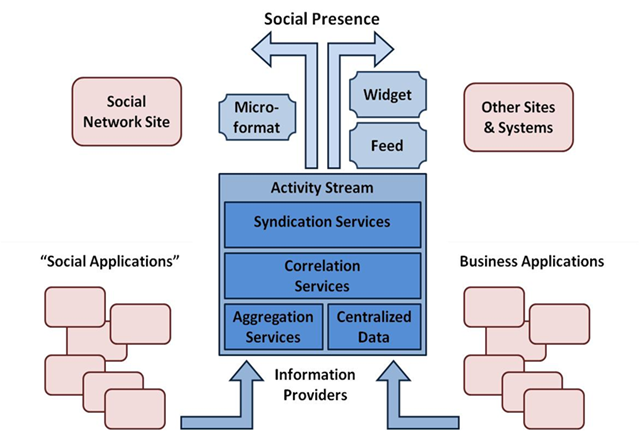 UC-related presence would be included in this model as a subset but the overarching solution is unlikely to be delivered by a UC platform itself. My firm belief is that such a solution cannot be delivered by platforms designed (and biased) towards SIP/SIMPLE. I honestly believe that the underlying assumptions (all the way back to the protocol specifications) bias UC-presence towards communications (which is perfectly fine). A social presence platform may however be delivered by some of those vendors that are active in the social computing space (but they really do need to start thinking more creatively and not be afraid to sub-optimize the overall presence role of their own UC platform). That said – some vendors have a shot here. Avaya (even though they are a UC vendor) took a bold step by adopting XMPP for its presence server. Feed syndication platform vendors such as NewsGator and Attensa could play a partner role for larger vendors. Jabber and Jive could play in this area as well given their XMPP centricity. (Note: My current thinking is that a social presence platform would rely on a combination of Atom/APP, XMPP and microformats). Larger vendors such as IBM would have to break from its UC-centric thinking around presence as would Microsoft. For Microsoft however this type of move is almost unimaginable given the centricity of OCS around SIP/SIMPLE and Microsoft's reluctance to integrate and interoperate with other vendors on a level playing field when it comes to presence. Oracle remains a dark horse as does SAP, although ESME is a nice start (congrats BTW to the people involved in ESME and to Dennis Howlett who seems to be the proud mother at the moment). The UC evolution of presence will go along its maturity path and will remain critically important to many organizations (e.g., more intelligent/rich, integrated within business applications) but the original lofty vision of presence portrayed by UC vendors will transition to social networking platforms. Those vendors had their shot. But the foot-dragging on openeness/integration/interoperability along with narrow-minded thinking and competitive shenanigans more than justify these vendors being tossed out as far as being thought-leaders on where presence needs to go – presence is simply far too important to leave up to UC vendors.